Tax policy frequently targets the choices that women face in many aspects of their lives. Decisions regarding working away from home, having children, marrying, registering a partnership or cohabiting with a partner all entail tax consequences. The end of the twentieth century saw progress in women’s legal and social equality, but many governments began to increase their reliance on the tax system as a means of influencing the choices that women make. The juxtaposition of this instrumentalist deployment of tax with persisting economic inequality for women is the starting point for this book. 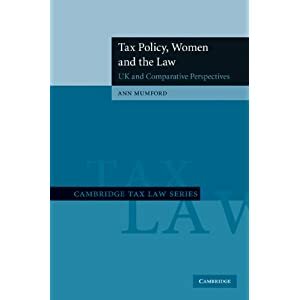 Employing a range of theoretical approaches, and grounding its investigations in sociological theory and cultural philosophy, it provides the foundation for a comparative, contextual consideration of the issues that arise at the intersection of women, tax policy and the law. Ann Mumford is a wonderful contributor to the international dialogue about gender and taxation, so I’m eager to read her book. This entry was posted in Feminist Legal Scholarship, Recommended Books, Sisters In Other Nations, Women and Economics. Bookmark the permalink.